First, indulge me in a little figure skating talk. Brasseur and Eisler, a Canadian pair team, had a daring move called "Fly High and Say Bye". It always brought the crowd to their feet. Wanna see it? Look for it around the 1:10 mark in this video. Fun, huh? But why take a walk down figure skating memory lane with the "Fly High and Say Bye"? Well, that's not so fun. My family is flying high on a trip to say bye to my Uncle, whose long battle with cancer ended early Saturday morning. 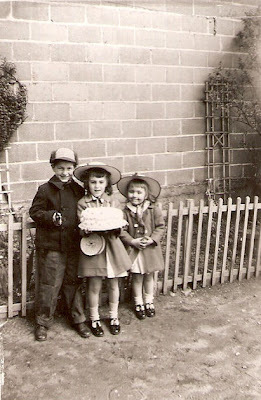 Uncle J, Mom and Aunt M. April 1949. Bye, Uncle J. I'll miss you teasing me about my knitting. I'll miss "fixing" your coffee just the way you like it. (Black, no sugar) I'll miss comparing medical devices with you. But I'm glad you are in a better place, whole and free from pain. Oh, Karen, I'm so sorry. What a great photo. I loved the skating video, too. have a safe trip, and i'm so sorry for your loss. you and your family are in my thoughts. I'm sorry, Karen. My thoughts will be with you and your family. I'm so sorry! I'll be praying for you and your family. What a great tribute to your uncle. You are in my prayers. In Case of Emergency . . .
Mmmmm, hungry . . . Putting out an A.P.B. . .
Oh, you can't have that . . .